-from "A Collection About Ohio County Public Schools," Levering C. Bonar, 1978, pg. 17. Clay School was a three-story, red brick structure at the south-east corner of 12th and Eoff Streets. It was enclosed with a cast iron fence. The play space was paved with bricks. Entering the wide, double door from Eoff Street, the broad hallway, high ceilings, and stairway dividing at the first-floor landing were picturesque. The school office was on the second floor above the first-floor entrance. Each of the three floors had four large classrooms with high ceilings. All toilets and the heating systems were in the basement. 1943 was the last year at 12th and Eoff. The site was purchased from Central Glass Works, N. B. Scott, President, in 1896, according to a record in the Ohio County Board of Education office. It was a three-story red brick structure containing ten (10) rooms. 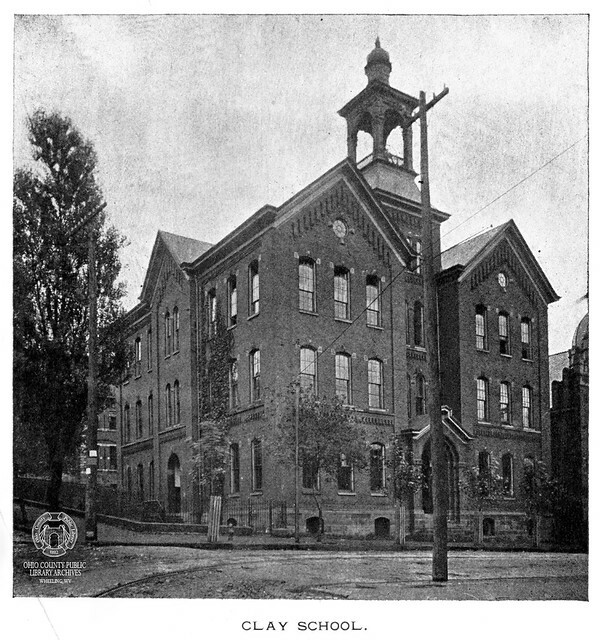 As an annex of Clay, it served the East Wheeling area in the lower grades until the Clay School was built at 15th and Wood Streets. In this time it gradually became an "Opportunity School" until the teachers devoted all their time to the training of children with special needs. In 1941 six parcels of land were purchased on Fifteenth Street from: (1) Thomas Thoner and wife - $15,000; (2) Fannie Youninger - $24,000; (3) Elizabeth A Daugherty - $9,000; (4) George Freeze - $10,000; (5) Samual and Rose DeFillippo - $10,000; (6) Wm. and Robt. Steadman - $7,000, for a total of $75,000. A thirty-five room elementary -junior high school with an auditorium and gymnasium was built under adverse conditions brought about by World War II. Building material was either frozen for war needs or was scarce because mills were converted to making war materials. The architect who drew the plans for the building accepted a commission in the army, his successor enlisted in the navy; finally, Phillip Faris supervised the completion of this building. With his help and valuable suggestions from the School Board President, Robert C. Hazlett, springs in the hillside were brought under control, and what might have been a disaster has served Wheeling East End for more than thirty years. In the fall of 1976 the Junior High School was moved to 2115 Chapline Street, former Wheeling High School building. This was a temporary arrangement until the South Wheeling Junior High School is completed. Clay was remodeled to more adequately serve the first six grades. ▶ Vertical File: Wheeling Schools A-Z, Wheeling Room, non-circulating, ask for access at the reference desk. ▶ "Wheeling Rediscovered: a bicentennial project of Ohio County's public, private and parochial school : essays, sketches and photographs on Wheeling's past, present and future," 1976. ▶ A Collection About Ohio County Public Schools, Bonar, Levering C., 1978. Call#: Wheeling 379.75414 B64c, Wheeling Room, non-circulating, ask for access at the reference desk. Call#: Wheeling 371.010975414 Ed83 1921, Wheeling Room, non-circulating, ask for access at the reference desk.